For my second post on how to recycle daily garbage (first was how to recycle eggshells) I choose plastic bottles, no matter what we do we use lots of them and I found some small and big projects to re-use them. It takes hunderds of years for plastic bottles to decay so your projects will be usefull for many years. 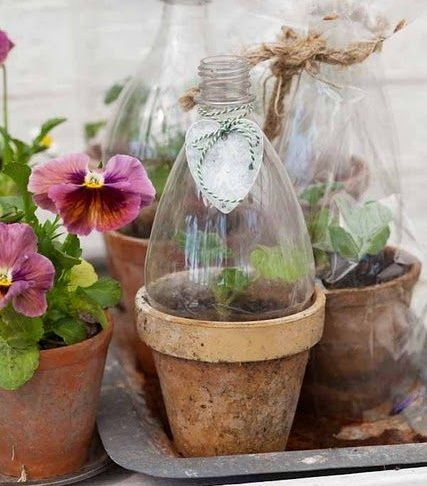 Cut a bottle in half to cover pots, this will protect newly sprouting plants against cold and snails, the damp inside the bottle will let the plant grow quicker. 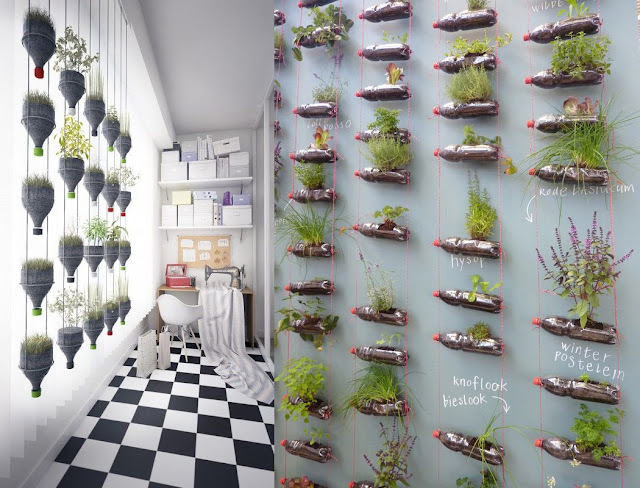 Hang a whole bunch of bottles in front of a window, filled with soil and plants it will create a green curtain in your room, and the plants will get plenty of sunlight. 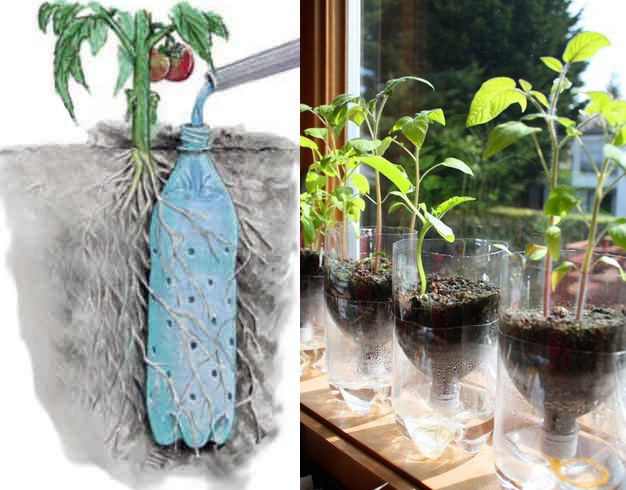 Make a bunch of holes in a plastic bottle, dig it in soil near vegetable or normal plants and create a slow watering system. Your roots will not rot and your plants won't dry out. Create a self watering seed starter pot simply by cutting a bottle in half, again perfect to avoid that your seeds and roots won't rot while they won't dry out when you do not water them every day. Make amazing flowers simply by cutting the plastic in flower shapes and heating them a little near a candle to make the petals curly. I also saw some amazing Christmas decorations during my search, even a Christmas tree entirely decorated with plastic and it looks fantastic! You can make smaller flowers, leaves and shapes to create jewelry. 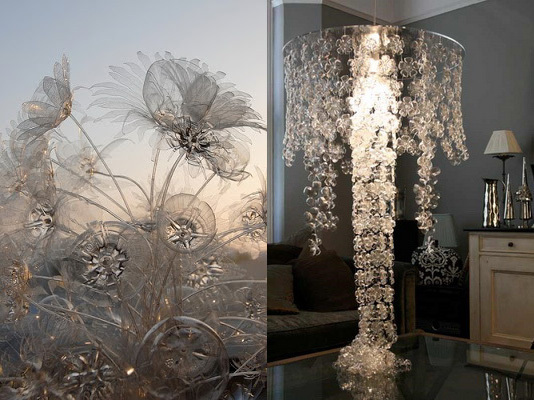 Michelle Brand makes Chandeliers all with plastic bottles, and they do not look like 'trash' at all, they are amazing, and you could make them yourself, double win. I've also seen cool room screens and curtains made out of plastic bottles. 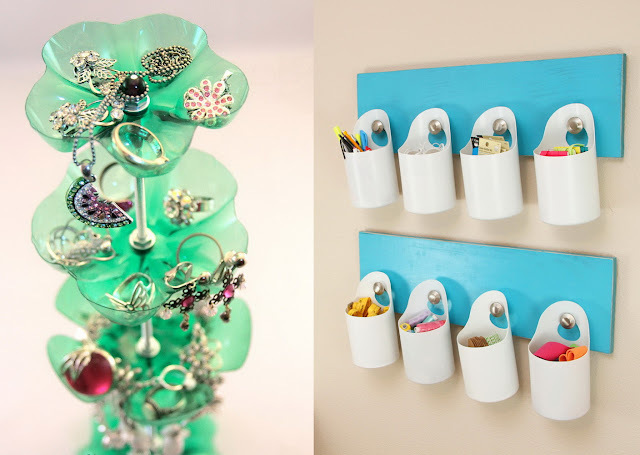 Make a cool jewelry organizer, I really like this one where you can storage any kind of jewelry, and there is a great tutorial for it. There are also plenty ideas to use them as storage containers, like this cute and easy to make peg basket, these hanging baskets would be great for craft and hobby rooms and even book and magazine storage. As the last idea I'm showing a big one, which you might never do but it is too cool not to show. 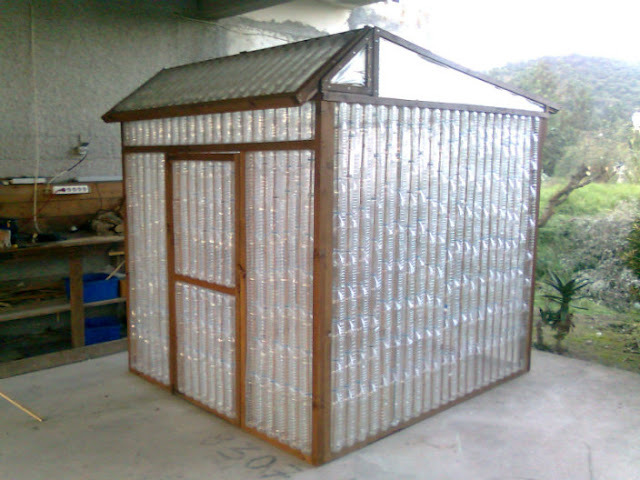 You can make a greenhouse of bottles, it will have the same effect as glass only won't cost you a thing and hail and such are not such a threat as with a glass greenhouse. Here you can read what you would need (mostly handy hands and a huge amount of bottles), maybe a nice family project. I have also read about several house projects built in Nigeria, and now also in some other countries. Some mentioned filled with sand but it can also be dry dirt. 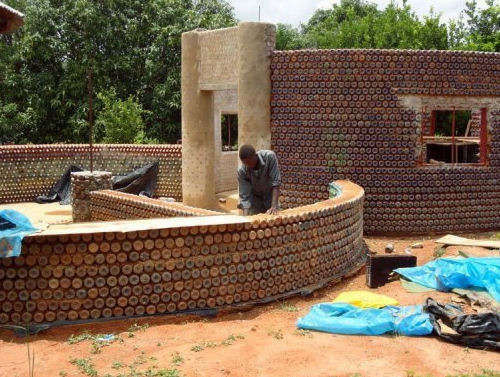 These filled bottles are 20 times stronger than bricks and are even said to be bullet proof! They become great isolated houses for not much money and for each one bedroom, living room and kitchen house 7800 bottles are used, so less trash and more roofs for people, such a great project! do you have a separate garbage container for plastic? the bottles are good for recycling in bulk, that's why the state collects them separately. Plastic bags and all the "dirty" plastic, like yourgurt bottles (those are forbidden in plastic containers here), everything that we throw away to regular garbage container is the worst. No one recycle this garbage and it takes so long to decay. No we do not have separate garbage here. There are paper and glass containers, but the recycling and separating is mostly done at the land field. There are many people who earn their living by collecting recyclables and selling them. Love those recycling tips... especially the garden projects!!! Love the double bottles used as water-holders, definitely one I will use! I also made a project in school (just a design idea) with glass bottles, from wich I made a building (small house), I think the course was Crisis Architecture. It looked a lot like the ones in your blogpost, but there was also the variant of leaving some of them empty so that the house can have natural light!